Insert the Ultimate Learning: Fun With Feelings CD-ROM into your CD-ROM drive. program will start automatically and you can skip the following two steps. After installation is complete, you'll find a Ultimate Learning: Fun With Feelings icon in the DigiSoft menu of your Programs menu and on your desktop. Ultimate Learning Fun with Feelings teaches your child to understand their own emotional states and the emotional states of other people. Read this Manual before playing the Ultimate Learning: Fun With Feelings. This will help your child play more independently later on. As you begin the program, you will see Login screen. 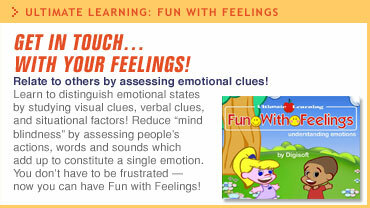 Fun with Feelings also has a learning center to teach the features of each emotion before or during the game. The learning center reinforces and supplements the information learned through playing the game. Click on the sign "Learning Center" to teach emotions. Enter child's name before start playing. Click on the flowers to select level of difficulty. Click on the sign "Play Game" to start playing. To change level of game select drop-down list clicking on the apple. All levels which are already played by child are available. To load saved game click on the sign "Saved". Press F5 to go to Print Mode. Press F6 to look at the progress of your child. Press F7 on the main screen to select any level. Click on the sign "Exit" to exit from the game. All answers that are not selected correctly the first time are repeated at the end of the level. The user cannot progress to the next level until they have answered all questions correctly the first time. Therefore the user is forced to succeed and learn through repetition. Click on the sign "Repeat" for repeating questions. Click on the sign "Back" to go back on the one question. Click on the sign "Exit" to exit playing. Child always can save the current game. Yes, Fun With Feelings is Available for Pocket PC Users too! Fun With Feelings software is also created to go with you and your kids on the go. Same great software, just in a format that can fit in the palm of your hand! DigiSoft is one of the leading developers of Windows CE (Pocket PC) based software. Try before you buy! Download and use a limited version of Fun With Feelings for free. It does not contain all of the levels or features, but you will be able to quickly determine if this software is for you and your kids. Fun With Feelings is available for $49.95 for Windows and is coming soon for Windows CE (plus $9.95 for shipping & handling if you want your software on CD-ROM). All five software titles are available for the special price of only $99.95 (plus $9.95 S&H) on the Ultimate Learning Software Suite.